Donald Trump’s chief propagandist and cheerleader, Ann Coulter, is the face of the alt-Right. Coulter has been a prominent member of the alt-Right community for decades. Over the past two years, Coulter’s beliefs and character have been exposed as never before. This is particularly problematic given her position as advisor to and promoter of the GOP presidential nominee. Her current book, In Trump We Trust, is a fawning tribute to failing candidate. The alt-Right, according to Jonah Goldberg, “want[s] to replace the conservative movement.” That is Coulter’s goal, too: Destroy and replace. 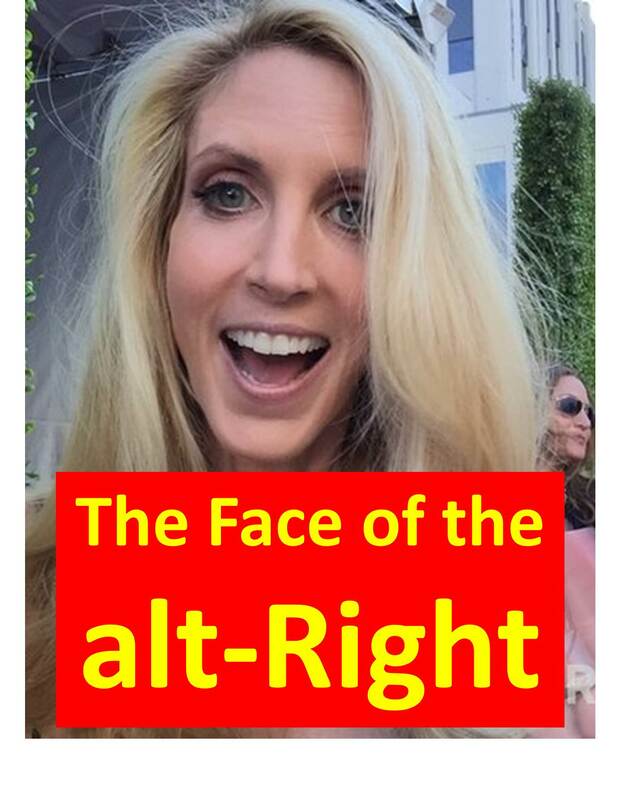 Following are the core beliefs and attitudes of the alt-Right movement as exemplified by Coulter. Once raised Catholic, Coulter now expresses deep animosity toward Catholics. She calls them “moral show-offs” and “fake Christians.” Her anti-Catholic sentiments have only grown worse as she seeks to create a New Know-Nothing Party. Coulter’s New Know-Nothing Party is modeled after the mid-19th century version, complete with its America First, anti-immigrant rhetoric and platform. Her nativism runs deep as she hates all immigrants and even hates Christian missionaries for going on overseas mission trips to save lives. Coulter even trashed native-born Gov. Nikki Haley, calling her an “ignorant immigrant.” Haley’s roots weren’t pure enough, unlike Coulter’s which trace back to the Puritans. 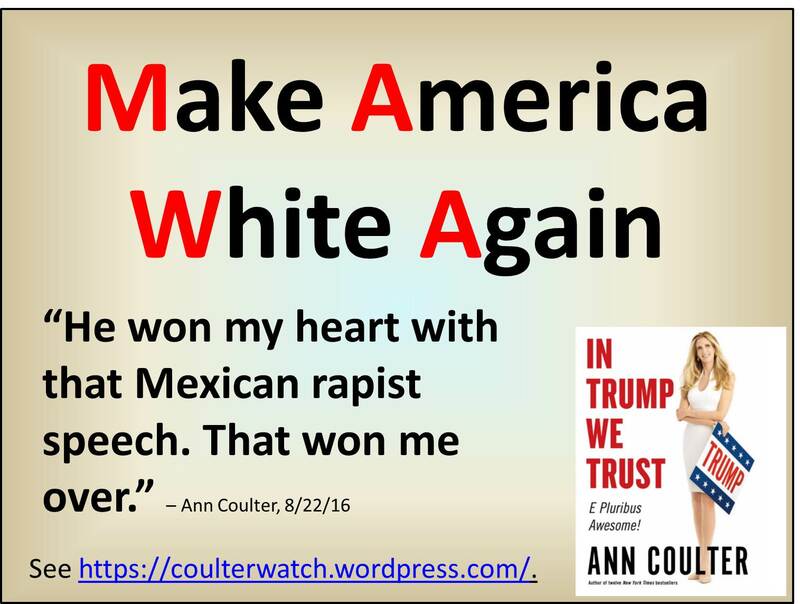 Race figures prominently in Coulter’s worldview and remarkably so. Yet, she remains very confused in her racial constructions, regards diversity as white, seeks a restoration of a white WASP nation, and argues that she and Trump deserve a “racism credit” for seeking to help blacks even as she advocates for her own (white) racial grievance industry. To that end, Coulter adopts and furthers neo-Confederate ideas, continually defends the Confederacy and Confederate flag, and has actually confused the Confederate and American flags! Coulter’s (and Trump’s) America is one where the elite few (like Coulter and Trump) would determine the nature of our national identity at the expense of individual liberty, the Constitution, and our founding ideals. If one is truly America first, then one must be #NeverTrump! See “Coulter Wants to Destroy GOP” at http://wp.me/p4jHFp-bn. Yes, I know, Conservatism and the GOP are not synonymous. However, Coulter has waged war – for years – against conservative and Christian ideals, values, and principles. She seeks to root out and destroy whatever opposes her will and willingly props up a would-be tyrant and statism to achieve her own objectives, whether they are peculiar and pecuniary or personal and political. See “I’m Ashamed Ever to Have Known You” at http://wp.me/p4jHFp-f1. 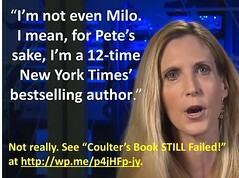 See “Is Ann Coulter Anti-Catholic?” at http://wp.me/p4jHFp-f7. See The Beauty of Conservatism, available as a free download at www.coulterwatch.com/beauty.pdf. 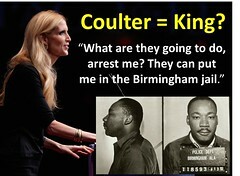 See “Does @AnnCoulter Love #BLM?” at http://wp.me/p4jHFp-fK. See “Trump, Coulter, and the KKK” at http://wp.me/p4jHFp-cF. See “Coulter Confuses Confederate and American Flags” at http://wp.me/p4jHFp-fg. See “Liberty Died in Cleveland: America’s Establishment Coup” at http://wp.me/p4scHf-g1.